Morgan O’Keefe feels trapped in a gilded cage. True, the thirty-year-old mother agreed to put her science career on hold to raise her young son while her husband pursued his high-powered job. But though Morgan loves many things about staying home with her child, she misses the thrill of working with her colleagues in the lab. She’s restless and in dire need of a change. Fed up with New York City’s hectic pace, Natalie Reynolds takes up her aunt’s offer to move to the Berkshires and house-sit her fabulous lakeside house for a year. Passionate about applying brush to canvas, Natalie is poised to become the artist she has forever longed to be. But life on Dragonfly Lake is never without surprises, and for a novice swimmer like Natalie, the most welcome surprise proves to be the arms of a handsome neighbor pulling her up from the water for a gulp of air. When her mother breaks her leg, Bella Barnaby quits her job in Austin and returns home to help out her large, boisterous family. Among her new duties: manning the counter at the family business, Barnaby’s Barn, an outdated shop sorely in need of a makeover. While attractive architect Aaron has designs on her, Bella harbors long held secret dreams of her own. 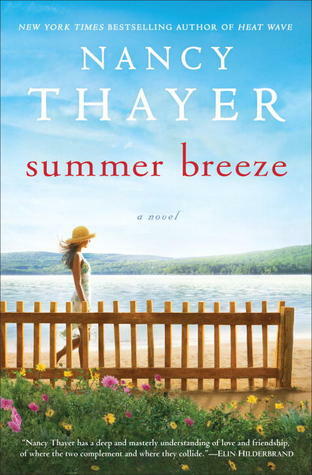 Summer on Dragonfly Lake is ripe for romance, temptation, and self-discovery as the lives of these three women unexpectedly intertwine.Summer Breeze illustrates how the best of friends can offer comfort, infuriate, or even—sometimes—open one’s eyes to the astonishing possibilities of life lived in a different way. This captivating novel displays a prestigiously gifted writer at the height of her storytelling powers. Thanks so much for the win.Nice way to start the week.